The NASA-led program will see the two space agencies build a lunar space station much like the International Space Station (ISS) that can home astronauts and will orbit the moon. 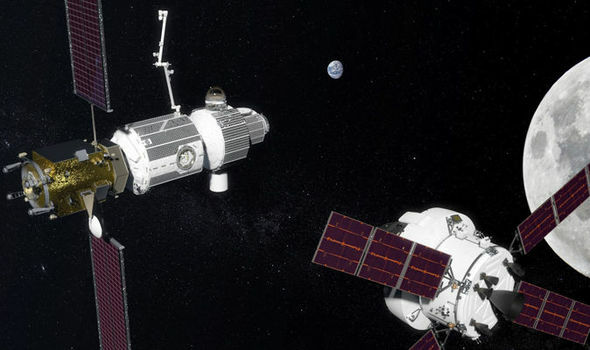 Dubbed the Deep Space Gateway, the station will allow astronauts to study the moon in close detail and will also be used a pit-stop for astronauts travelling farther out into the solar system, particularly Mars. Roscosmos said in a statement: “The partners intend to develop international technical standards which will be used later, in particular to create a space station in lunar orbit. “Roscosmos and Nasa have already agreed on standards for a docking unit of the future station. Construction is set to begin on the project in 2022, with the first modules of the Deep Space Gateway envisioned to be completed two years later. The craft itself would be powered by NASA’s newly created Solar Electric Propulsion (SEP) – technology which garners power from the sun to drive the spacecraft. When outlining their vision back in March of this year, Nasa said: “Nasa is leading the next steps into deep space near the moon, where astronauts will build and begin testing the systems needed for challenging missions to deep space destinations including Mars.